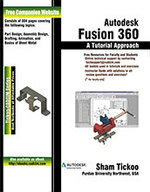 Autodesk Fusion 360: A Tutorial Approach introduces the readers to Autodesk Fusion 360, the first 3D/CAD/CAM/CAE tool that connects the entire product development process in a single cloud-based platform where different design teams work together in hybrid environment and harness the power of the cloud when necessary as well as use local resources. The chapters in this textbook are arranged in pedagogical sequence that makes it very effective in learning the features and capabilities of the software. This textbook covers all important topics and concepts such as Part Design, Assembly Design, Drafting, Animation, Basics of Sheet Metal. Textbook consisting of 10 chapters that are organized in a pedagogical sequence. More than 40 real-world mechanical engineering problems used as tutorials and projects with step-by-step explanation.